The Sri Lankan government has formally withdrawn from a ceasefire agreement with Tamil Tiger rebels. It said escalating violence had made the Norwegian-brokered truce redundant. The accord came into effect in February 2002 ahead of inconclusive peace talks. Since mid-2006 troops and rebels have fought regular clashes, despite the deal still technically being in place. There was no immediate response from the Tigers, who want independence for Tamils in Sri Lanka's north and east. "The Cease Fire Agreement [CFA] had been violated nearly 10,000 times by the Tamil Tigers, so we should annul this agreement," the cabinet's spokesman on security matters, Keheliya Rambukwella, told the BBC. "National security is threatened at every corner," he said. Mr Rambukwella said that the "foremost thing in the country is to uphold national security" which was why the government had taken the decision. He said that withdrawal from the CFA was not a declaration of war against the Tamil Tigers, and would be done in a way that does not breach the conditions of the agreement. 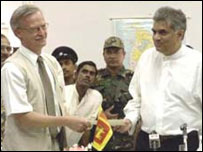 Under the February 2002 ceasefire brokered by Norway, both the Sri Lankan government and the Tamil Tigers have the option to withdraw from the CFA after giving two weeks' written notice to the Norwegian foreign minister. Last week, Sri Lankan Defence Secretary Gotabhaya Rajapaksa said in public that the truce between the two sides was "moribund" and that the CFA was a "joke". Correspondents say that even though both sides acknowledged this to be true, neither wanted to be seen as the first formally to withdraw from the ceasefire. Mr Rambukwella argued that the government had already taken steps to address the grievances of the minority Tamil community and was holding talks with moderate Tamil parties. So far there has been no word from the Tamil Tigers on the government's announcement, but some analysts have warned that the development will only serve to polarise the two sides. About 5,000 people have been killed since early 2006, taking the total number of dead since the war erupted in 1983 to around 70,000. Earlier on Wednesday, a bomb targeting a bus in the capital, Colombo, killed at least four people and injured another 20, police and military officials said. The blast took place as the military bus was passing a busy junction in a district that houses key military installations, reports said. A hospital official told Reuters that two of those killed were soldiers. Military officials said they suspected the Tamil Tigers. The rebels denied involvement, Reuters reported.